Walking the Berkshires: "I Do Not Bite My Thumb At You, Sir, But I Bite My Thumb, Sir!" "I Do Not Bite My Thumb At You, Sir, But I Bite My Thumb, Sir!" My 1964 edition of The American Heritage History of World War I includes this photograph from the collections of the Imperial War Museum. 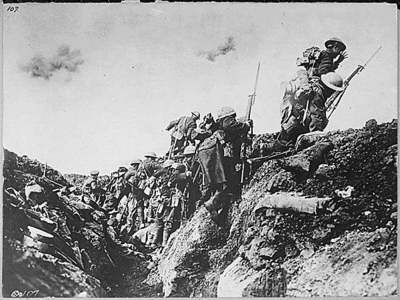 It depicts Canadian troops under fire in the Battle of Vimy Ridge in 1917, but something about the caption strikes me odd. I wonder if this is an accurate description of what the camera actually captured. Is that soldier thumbing his nose or grimacing at the point of impact? Is anyone holding that rifle, or did he just drop it? And was "cocking a snoot" a standard gesture of contempt utilized by Canadians in 1917 as the American Heritage editors suggest? I don't know the answers at the moment. Let's see if we can figure this out and test the hypothesis of the caption with an alternative explanation. Nose thumbing, it turns out, dates to at least the 18th century so they are on safe ground there. But at least one source claims that as far as derisive gestures go it is a fairly mild one "used in (gentle) mockery." Furthermore, in a discussion on nose thumbing at this site, one participant reveals that in the 1930s and 1940s in London when he was growing up, thumbing one's nose was very popular among children but "was almost never used by adults and was regarded as childlike." Biting one's thumb, on the other hand, is definitely a rude British gesture of long standing - it makes an appearance in the first scene of Romeo and Juliet - but this soldier's hand seems too far from the teeth for that to be what he is supposed to be doing. Who can say what primal impulses will be jarred loose from the subconscious mind in combat, but I remain unconvinced that a veteran of trench warfare in 1917 would deliberately thumb his nose at the enemy lines when going over the top. Kick a football, yes, but nose thumbing seems a stretch. We do not yet have a case for an alternative hypothesis that something else is going on in this photograph. Let's take a closer look. The Canadians left their trench with their rifles held "at trail", grasping the stock in the right hand about midway along the barrel. There is the merest suggestion of a hand in that position on this soldier's rifle, all but obscured by the head and helmet of his comrade climbing over the top beside him. I would be more comfortable saying that the soldier has not dropped his rifle if I could determine which hand is outstretched near his face. For the caption to be correct, it ought to be his left. Is it? The photographer's viewpoint is angled up at the soldiers leaving the trench with the sun behind him and a bit to the left. The outstretched hand is in deep shadow, but there are lighter spots that could be knuckles, or part of a palm. It is very hard to say which way the silhouettes of fingers are curving. That little finger in particular just doesn't look right for a hand with the palm facing forward. But what about that black wedge between the other soldier's helmet and the right elbow of our alleged nose thumber? Is it a gas mask on his chest? If so, the weight of evidence suggests that the right arm is holding the rifle, and the left hand is raised near the face, but it is hard to tell for certain. On the presumption that this is his left hand, the wrist appears to be bent well back. Try an experiment for me. Take your left hand and thumb your nose at the computer screen - the shades of these veterans will forgive you, this is for posterity. How is your hand aligned with your wrist? Mine too. I don't think this soldier's hand is at a natural angle for nose thumbing. I think instead he may be flinching, as if to ward off a blow, or perhaps having just received one. All this is conjecture, my case as precarious as a house of cards. Maybe the American Heritage editors got it just right. Then again, maybe there is more here than a shadow of a doubt. What the Canadians did that day at Vimy Ridge is beyond question. Whether this one soldier went into battle thumbing his nose at death or straight into its arms remains to be seen. Canadians (along with British of 1st and 3rd Army) went ''over the Top'' at 05:30AM on April 9th, 1917 - the Sun was not up yet, sleet was coming down - definitely not a picture during the Battle of Vimy Ridge. I investigated this picture several years ago, as it was believed to show the ''Van-Doos'', a well-known French-Canadian Regiment going over the top on the Somme. They had taken the small town of Courcelette on Sept 15th 1916 (http://www.somme-1916.com/courcelette.htm) and were launching an attack against Regina Trench at a very odd time: 15:15, October 1st (which makes sense with the photo). My interest rested in the fact that my Grand-father's younger brother received a bullet-wound during that attack - perhaps he was on the picture! By ordering a copy of the original from the National Archives of Canada, I found out that it was simply ''Canadians soldiers training - Fall 1916''... disappointing but the journey was interesting! No Thumb biting either! It is part of a series of pictures, some taken from ahead of the soldiers (obviously not possible during real combat situation!) - the Sergeant is not wearing a helmet - some rifles are wrapped with jute around the trigger area - the picture cannot date from earlier in the year as the soldier have Lee-Enfield’s, not the Canadian-made Ross rifle, that got replaced starting in June 1916. I do believe it is his left hand. You can just barely make the outline of his right arm intersecting in front of the rising left hand. The only thing one can conclude from this photo is that we do not have enough information to conclude anything about his pose. He could be thumbing his nose, he could be reacting to gunfire, or he could just be reaching up to adjust his helmet. simply looks like a hand going up to block the sun or to his helmet to me. My grandfather was in this picture. My father told me that this picture is a reinactment of going over the top as film back then was not fast enough to capture the action. It seems very unlikely to me that this soldier thumbed his nose at anyone. I do think it's his left hand up in the air, though. This is fascinating. Closer examination reveals the soldiers hand looks oddly out of place. The fingers look too thin and the angle unnatural. And what happened to his rifle? Is it falling? I cannot see any indication of his right hand holding it. The only explanation that makes sense to me is that he has just been surprised (or shot) and has let go of the rifle. His stunned state could explain the unnatural look of his left hand. This is almost bizarre. Thanks for posting it.